Tilted Horizons: Rev It Up for RevZilla's Newest Motorcycle Gear Giveaway! Rev It Up for RevZilla's Newest Motorcycle Gear Giveaway! Revzilla has outdone itself this month, putting $640 worth of top-quality Rev'It! gear up for grabs. 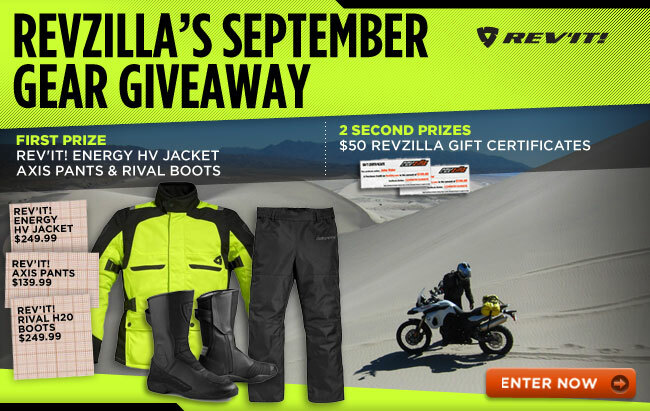 Click on over to RevZilla's September contest page to enter. The First Prize winner this month will receive Rev'It! 's Energy Hi-Viz jacket, Axis pants, and Rival H2O boots (I've been eyeing the Rivals lately to replace my aging Rev'It! Fusion boots). $50 Revzilla gift certificates will go to the two Second Prize winners. While you're on RevZilla's site, take a look around at what RevZilla has to offer the serious adventure-touring or sport-touring motorcyclist. Why shop RevZilla? I can tell you why I do: fast, free shipping for orders over $39.99; TeamZilla cash back program; "no hassle" exchanges; no restocking fees; price match guarantee; and above all, RevZilla's top-flight reputation among riders I know for its customer service and product knowledge. Let 'em know Tilted Horizons sent ya! My other half @crudmop won the (May, i think it was?) REV'IT gear giveaway and got a pair of Sand pants and a Sand jacket. W00T! Good luck to those of you who enter!